Today our “Primary Highways” series continues with a visit to our nation’s capital and the neighboring state of Maryland. The oft-used phrase “inside the beltway” literally means inside the Capital Beltway (I-495 and I-95), which forms a wide circle outside of Washington, DC through the surrounding suburbs of Virginia and Maryland. From the western side of the beltway, we begin on Interstate 66 and US 50 heading east from Virginia over the Potomac River. I-66 turns north while US 50 continues eastward as Constitution Avenue, passing alongside the National Mall and all the national memorials and monuments, which are arranged around the mall and the parkland along the Tidal Basin. On the north side of US 50, opposite with Washington Monument, is the Ellipse, a public park that borders the iconic south lawn of the White House. This building and the privilege of occupying it are the nominal reason we are doing this series. Past the White House and Washington Monument, US 50 meets US 1, and the two continue as Constitution Avenue alongside the eastern half of the Mall. This section of Mall houses the many museums of the Smithsonian Institution. As a child visiting Washington, DC, the “Smithsonian” was synonymous with the Air and Space Museum. It was of course exciting to connect with all things space. Years later, I visited the Air and Space Museum again with my family (and saw a Star Trek anniversary exhibit), but also was enticed by a welcoming sign to the interesting circular building that housed the neighboring museum. The Hirshhorn Museum is the center on the Mall for modern and contemporary art, and a place I try to visit when I have time alone in the capital. It’s a been a while, so I would like to visit again sometime soon. You can see the Hirshhorn in the image of the Mall shown above as the cylindrical building just left of the center. At the far eastern end of the Mall is the Capitol. The huge building serves as model for many (though as we have seen, not all) state capitol buildings. Though it had a long history of designs and changes before acquiring its current design and the large iconic cast-iron dome we know today. You can read more about this history here. Of course, the institutions housed inside have served as models as well, sometimes in a less-than-ideal way. The Capitol is surrounded by several blocks of grounds, including the Capitol Reflecting Pool. While wandering around these grounds on foot, one would probably not suspect that there was a major highway passing underneath. I-395 traverses the center of the city in the long Third Street Tunnel, connecting to US 50 (New York Avenue) in the northern sectors. The densely packed residential sections of the Capitol Hill neighborhood can be found to the east, and a lively urban neighborhood to the northwest around Logan Circle. I would be remiss if I did not mention the Black Cat, and institution for independent music that also happens to have a great name. South of the Third Street Tunnel, I-395 continues towards Virginia and a junction with the Beltway at the Springfield Interchange (aka, the Mixing Bowl). Before crossing the Potomac, it intersects with I-695, a short connector to the Anacosta Freeway in the southeast section of the city. It is signed as I-295 and also as DC 295. It is the only signed DC highway that currently exists, but it is another thing that gives the District of Columbia the trappings of a state, except of course that it isn’t a state and doesn’t have voting representatives in Congress. Hence another state-like item, the district’s license place, continues to bear the Revolutionary War slogan “Taxation without Representation”. …where it continues as Maryland Route 295, the Baltimore-Washington Parkway. The parkway is partly maintained by the National Park Service. In this segment, it is a wide road through wooded surroundings, although industrial and suburban areas are never far away. 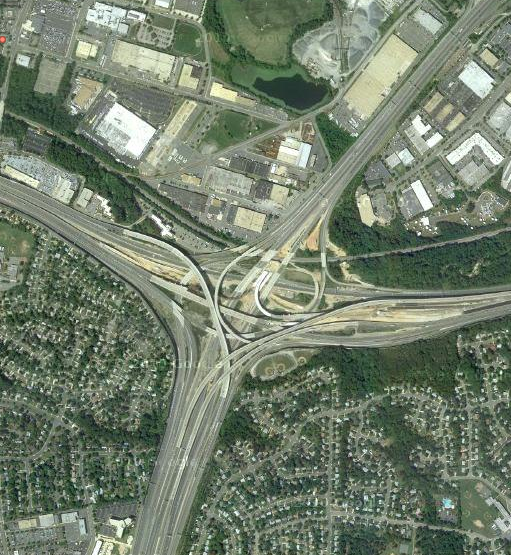 Further north, it becomes an expressway through the suburbs south of Baltimore as it heads towards that city. The parkway ends at a I-95. Nearby, a larger and impressive junction over water takes the short I-395 (completely unrelated to the one we just left in Washington, DC.) until downtown Baltimore, passing by Camden Yards and just to the west of the Inner Harbor. The Inner Harbor is considered an urban planning achievement, turning a moribund harbor in a major tourist and business destination. It look quite vibrant, with modern buildings and attractions like the National Aquarium. Perhaps more typical are the long stretches of similar brick rowhouses. Sadly, many seem to be in disrepair, as along this street in a neighborhood west of the Inner Harbor. One interesting view in the same neighborhood features this full overhead sign along an abandoned ramp that is used by pedestrians. US 1 is in fact nearby, so the sign is accurate, but it could still be considered an example of a Thomasson, a maintained architectural feature that no longer serves its original function. It was part of the cancelled I-170 highway. Baltimore is also home to Johns Hopkins University. It is of course a renowned research and medical university, but the division I know best is the Peabody Institute, as several musical friends and colleagues have studied there, particularly in their classical and music-technology programs. We head south from Baltimore towards the Chesapeake Bay on I-97, where has the distinction of being the shorted two-digit interstate. It passes through hills and suburban towns to US 50 near Annapolis, the state capital. I remember visiting Annapolis in 1999 and 2000. The 1999 visit included walking around the historic district and into the statehouse, one of the oldest in the country with a distinctly colonial look about it, and watching July 4 fireworks on the bay. It was also during an intense heatwave, with some days over 100F. I didn’t mind the heat too much, and it made it great weather for swimming. The towns and cities along the bay, including Annapolis, seemed intimately connected to the water. US 50 (with US 301) continues east on the Chesapeake Bay Bridge to Maryland’s eastern shore region. It then heads south, avoiding Delaware, before turning east again towards the Atlantic Ocean. It’s final terminus is in the resort town of Ocean City. The highway has a cerimonial terminus at MD 528, not far from the Ocean City beach and boardwalk, with a sign stating that is 3072 miles to its western end of Sacramento, California. I have seen the companion sign on the Sacramento side stating that is 3072 miles to Ocean City. Apparently that sign is stolen quite often. 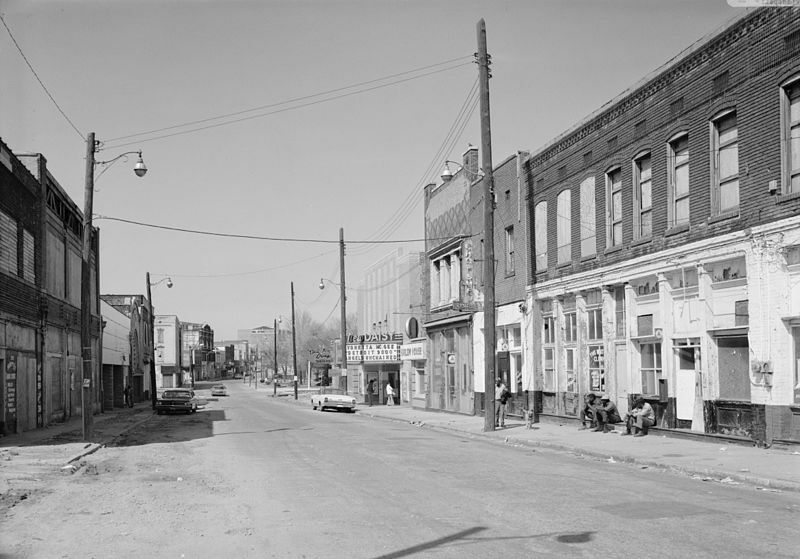 Back in Baltimore, we return to the western neighborhoods, not far from the rowhouses we explored earlier, and head west on US 40. Just past Gwynns Falls / Leakin Park, we come to a parking lot that is the eastern terminus of Interstate 70. It was originally planned to go further through the city, but that extension was ultimately cancelled. In this case, we take I-70 westward out of the city. This part of the state is quite sparse west of the Baltimore metropolitan area is quite rural and sparse, and in some ways would seem to be a separate state, more in common with West Virginia. I-70 and US 40 run together or nearby for much of the region. As I-70 heads northwest into Pennsylvania, I-68 continues with US 40 west through the Appalachian Mountains, including this cut through Sideling Hill. This does seem a world away from Ocean City, and from Baltimore and Washington, DC., but in total Maryland is actually a fairly small state. This concludes this edition of Primary Highways. We will next be visiting Wisconsin.